The Rethinking Research Collaborative (RRC) is an informal international network of academics, civil society organisations and social movements, international NGOs, and research support providers who are committed to working together to explore the politics of evidence and participation in knowledge for international development. The RRC aims to encourage more inclusive, responsive and transformative collaboration to improve the production of useful research for social justice and global development. Our Discussion Guide and Tool Kit – NOW AVAILABLE! In the first context-setting seminar of our ‘Evidence & the Politics of Participation’ seminar series, 38 of us convened in Bloomsbury Central Baptist Church’s Friendship Centre for a day, followed by a smaller group planning meeting the following morning. Some were employed as academics by universities, some worked in international NGOs, most had worked in both types of institution, and all were interested in the theme of evidence and research partnerships. This first seminar offered an opportunity for us to articulate our starting-points – our experiences of partnerships and evidence – and our ambitions for the series. On reflection, what stayed with me after the seminar was a sense of the informality and personal nature of these ‘research partnerships’. My main concern here is to problematize the idea of ‘partnership’. I worry that it sounds both too smooth, straightforward, and complete, and too formal and official. As Chik Collins has observed, the term ‘partnership’ can too easily be used as a de-politicising buzzword, to claim engagement and inclusion, irrespective of the experience of the ‘partners’. Emmile Aveling and Sandra Jovchelovitch have pointed out that ‘partnerships’ are made up of particular people, with particular interests, psychosocial histories, forms of knowledge and constraints. ‘Partnerships’, they argue, are ‘knowledge encounters’, sites of tension in struggles over legitimacy, knowledge and interests. They are social relationships between situated persons – as much as they are formal arrangements between institutions. In our discussions in the seminar, it seemed to me that it mattered who those persons were, and how their ‘partnerships’ evolved. We rarely spoke about struggle or conflict, but we did speak about happenstance, organic evolution, and personal relationships. Indeed, as Jude and Kate have written, the very origins of the Seminar Series lay in a combination of informal happenstance and professional rationale. It emerged in the seminar that the work of several of the partnerships was funded by internal funding (rather than external donor funding), or was unfunded. Participants repeatedly spoke about the freedoms that came with internal funding, particularly not being accountable to other organisations’ goals or timeframes. They felt this allowed for creativity, novelty and openness that did not characterise externally-driven work. In discussing our own research partnership, Jill Russell of the International HIV/AIDS Alliance and I spoke of it as organic and evolving. Initiated by the Alliance’s use of internal strategic funds, the partnership evolved in a serendipitous way, as we discovered new mutual interests and opportunities. It involved much ‘in-kind’ work – unfunded time that we were willing to commit because of the promise of the partnership for each of us. In another case, a researcher described how the loss of key contacts from the INGO partner meant that for several months, the research was adrift, unable to continue until new recruits to the INGO took an interest in the research project. This example showed both the dependence of the project on key individuals, but also the risks of that dependence. It was an example used to make the case for ‘institutional buy-in’. While I have emphasised the informal, there was certainly a case for the formal. Some of the partnerships that we will discuss in future seminars have a formal institutional agreement that goes beyond individual relationships. It will be valuable to understand the benefits of these, and the specific ways of working of the more formal compared to the more informal partnerships. A participant pointed out that the institutional commitments are not equally important to both sides of the partnership. If an academic researcher moves institution, the INGO relationship can move with the researcher – but the converse is not so true. So perhaps institutional commitment from the INGO is more crucial to a successful partnership than institutional commitment from a university. It almost goes without saying that partners have different perspectives. The reason for working together is that each brings something different to a project that becomes more than the sum of the parts. The different perspectives are rooted in different sets of resources, relationships, priorities, reward structures and world views. The success of a partnership is likely to be important to each partner – but with different priorities, the definitions of success may differ. What is more, the work that each partner has to do in order to make the partnership work is somewhat invisible and difficult to understand by the other partner. A research partner might expect an NGO partner to ‘deliver’ a good sample size, following academically rigorous inclusion and exclusion criteria. The practicalities of actually achieving that sample are often invisible to the researcher, and the reasons for the strict criteria might be obscure to the recruiting NGO. In such a context, of invisible work, the value of trust, goodwill, and in-kind work cannot be underestimated. Each partner need to able to trust that the invisible or obscure work of the other partner is done in good faith and with appropriate expertise. This is not the only necessary condition, but it is a part of the story. The termination of the VOICE project – a research project testing the efficacy of anti-retroviral drugs in preventing acquisition of HIV – has recently been in the news. Testing these drugs depended upon a partnership between the researchers and the women who would voluntarily take the drugs. The trial was ended early by its data and safety monitoring board, because it was clearly not working. Women were simply not taking the drugs. What was going on? On paper, some kind of formal procedural partnership existed: women collected drugs, returned empty containers, reported that they took the drugs, did not complain, gave blood samples, and were paid. But the women were certainly not entering into the spirit of what the researchers intended. Ida Susser argues that the researchers failed to build trust with the women, or to tailor their programme to local need. She argues that other projects, which have committed to meaningful community engagement, have, as a result, had more success. Formal partnerships with written contracts, agreed exchanges, deliverables, timeframes, and penalties, have their purposes. But without stocks of goodwill, trust, and commitment, those formal partnerships may produce very little. Mutual trust and commitment are terms more associated with the less formal-sounding ‘relationships’ rather than with ‘partnerships’. According to Susser’s account, the researchers set up the project on their terms, in line with their assumptions about drugs and behaviour, and in order to test their research questions. They did not engage with the reality of the research participants. The participants did not trust or respect the intentions of the researchers, and the whole project fell apart. As well as being informal and partial, partnerships are complex. 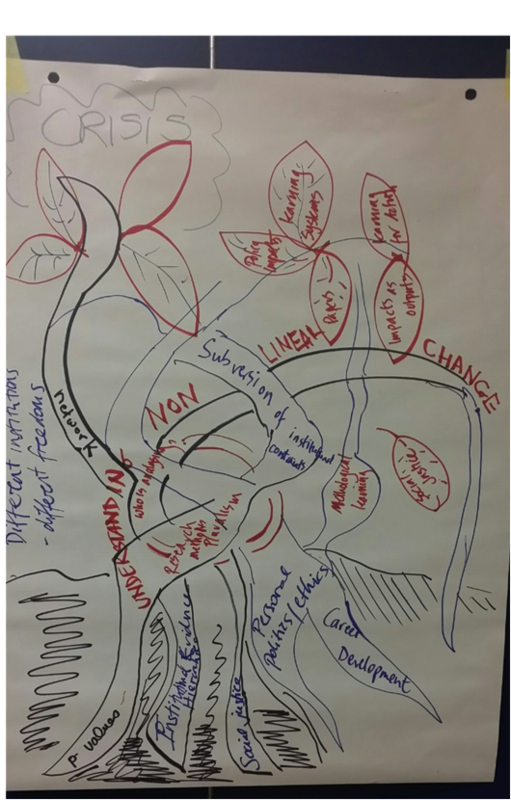 In one of the seminar exercises, small groups drew ‘evidence trees’ – to capture our representation of the ‘roots’, the ‘trunk’, and the ‘fruits’ of research partnerships. Several groups problematized a linear relationships between roots, trunk and fruits, drawing branches returning to the ground in a cyclical process. Some groups also wanted to describe the process and the evidence as multiple – an intertwining of different influences and versions – rather than as a singular linear, agreed upon process. Our evidence tree photographed here shows the multiple influences on academic researchers, including personal values, institutional evidence hierarchies, commitments to social justice and career development ambitions, all coming together to produce a complex multi-trunk tree which (ideally) allows for pluralism about research methods, subversion of institutional constraints, and inclusion of a variety of voices in the analysis, all in a process of non-linear change. Idealistic, perhaps, but clearly we wanted to convey multiplicity and complexity! Other disruptions were evident too. One participant mentioned that participatory research skills are often located in NGOs rather than in universities. Another commented that, in the field of design, it is widely accepted that innovation emerges from users, rather than from universities or experts. Research partnerships, thus, are complex collaborations, with dispersed sources of insight, novelty and critical thinking. Preserving, responding to, and analysing that complexity, might be a task for future seminars. How to take this further? In reflecting on what we have managed to say in the seminar so far, to inform where to go next, I have two observations. The first is that, even in the informal, small, supportive space of the participatory context-setting seminar, very little that was ‘negative’ about partnership experiences emerged. Tensions, struggles, disappointments or failures were barely present. The following day, with a smaller group, and perhaps crucially, an incomplete group, challenges emerged more directly. People spoke about deep frustrations and enormous workloads as they tried to work around failures to implement the research in the way they had intended. In these challenging examples, it was notable that not all of the partners who had been involved were present. Is it just too difficult to speak of challenges in front of our partners, lest our comments be heard as blame? Maintaining partnerships probably requires much generosity. Being open about difference might not always be easy or appropriate. Yet it seems important, in the quest to realistically problematize partnerships. The future seminars in this series have been designed to create a safe space to address such challenges critically, by restricting participation to a small core group who attend each of 4 seminars, building history and trust together. The second is a concern to get beyond banal platitudes about ‘what works’. There was much agreement, for instance, on the first day, that ‘institutional buy-in’ and ‘shared understandings’ are important. I worry that these sound like the positive buzzword ‘partnership’ – something everyone can agree to, but that says nothing about the specifics or the tensions. To understand complexity, we need to attend to the situatedness of partnerships – their specific histories, contexts, politics, emotions, resistances. At the same time, we hope to learn something together that can be taken away to practice in INGOs and academic environments. Together, we identified two ways into this endeavour: firstly, techniques of reflective practice, such as creative writing, a selection of which our colleague Jethro Pettitt is collating for us, as helpful analytical devices; and secondly, using specific lenses from theory, philosophy, or historical perspectives, to give us a way in to seeing more in these partnerships than initially meets the eye. Having had the scene set by an amazing group of participants in the first seminar, I’m greatly looking forward to the fruits of these further investigations in the seminars to come!